WAFFLES: Hey Boss, Glogirly's coming home before Christmas isn't she? 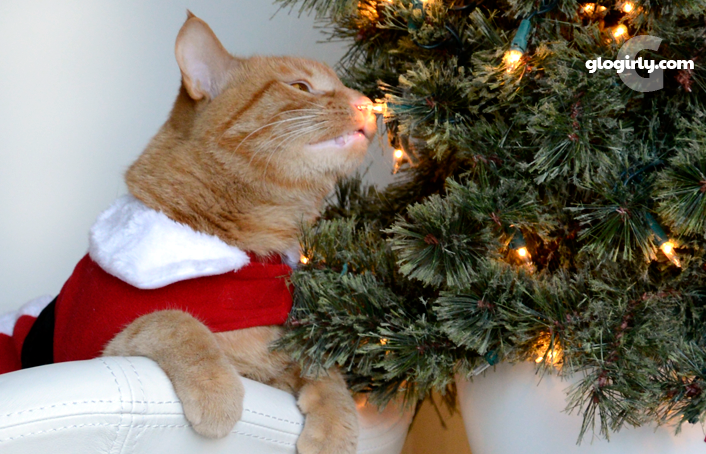 KATIE: Just three more sleeps, Waffles. Plenty of time before I give you your Christmas gift. WAFFLES: Awww, Boss. You shouldn't have! Katie and Waffles are missing their girl, but probably not nearly as much as their girl is missing them. She's been working in Atlanta, setting up Christmas displays for over a week now. One of the displays she's been creating has over 144 Santas featured in it. But none nearly as adorable as Santas Waffles and Katie. Waffles, I'm not so sure I'd be excited about your gift from Katie! A little frightened, maybe. We wish Glogirly safe and uneventful travels. Oh Katie! You wouldn't....would you? You two are just adorable. Well no one is as cute as Waffles, according to the woman. All that display with all those Santas really needs is Waffles and Katie in it. Come home soon Glogirly...we all miss you! We wonder if Glogirly is Santa? Be careful Waffles! I'll save you- I volunteer even, and I don't even know what you need saving from yet. Y'all do look cute in yous Santa suits. Have a gweat weekend. Only three more sleeps? Hurry home Glogirly! We know you will be very happy when Glogirly comes home. You make an adorable Santa. Only 3 more sleeps...hang in there. I hope we get to see the display she is working on, but I agree no Santa is as cute as you both. P..s You two are adorable in your Santa costumes. Merry Christmas to you! 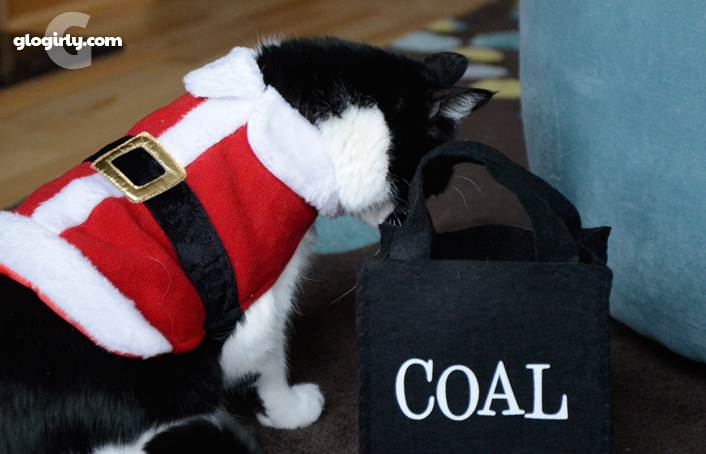 Did that bag say 'coal'???????? Whoa! 144 Santas? Pop loves the fat guy in red. I love Katie and Waffles. Glogirly will be home before you can say "Ho, ho, ho" Waffles. 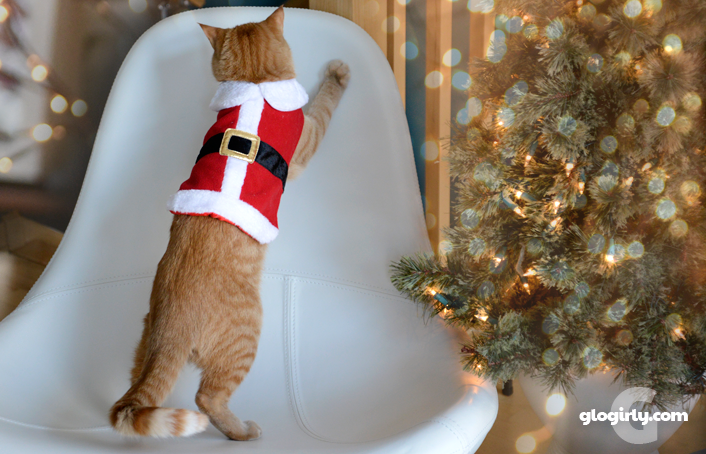 We hate to admit it, but you both look adorable in your Santa outfits. It takes very special kittys to wear costumes. 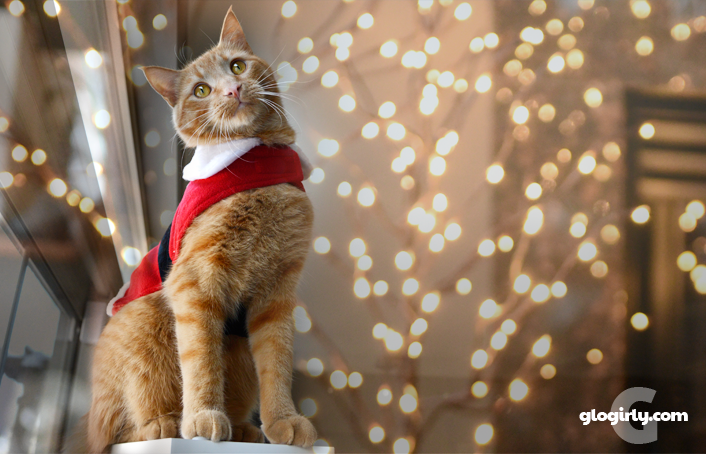 We really hope that when our Human sees the photos of Waffles & Katie dressed like Santa that she doesn't get any ideas for doing the same thing to us. If she tries dressing us up, we may have to put the bitey on her as a gentle reminder that we don't do clothes - no matter how "cute" Humans think it looks. I'm so grateful that our local Petco never has clothes for cats. They barely have harnesses. Mom has to go into the "big city" for any other kind of pet stores. Katie and Waffles always rock their clothes! You are such cuties in your little Christmas outfit! A safe return home for Glogirly. She will be your best Christmas gift!